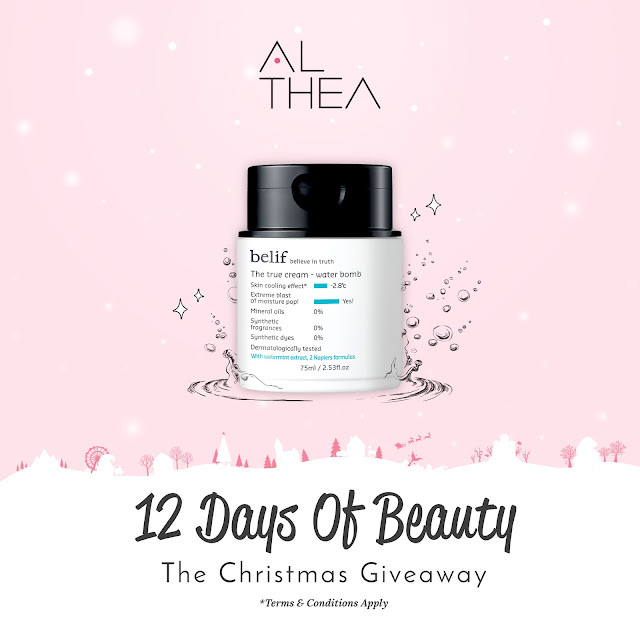 It’s officially the last day of Althea’s 12 Days Of Beauty! We love the season of giving, and today will definitely be no exception to that rule, after all, we're big fans of the phrase "go big or go home". We’re going to be doing our biggest giveaway yet, so be ready for this bomb. A Water Bomb, that is! That’s right, we’re giving away one of our best selling items from Belif, their True Cream Water Bomb! As you all know, the key to the Korean 'chok-chok' look is hydration, so this moisturizer is right up our alley. This baby is a super lightweight oil-free cream-gel that 'bursts' and refreshes the skin while providing it with rich hydration. Rich in antioxidants, this moisturizer helps to neutralize skin-damaging free radicals while improving skin's elasticity and minimizing pores. This 75ml cream has a weightless formula absorbs into the skin quickly and completely, keeping your skin soft and supple without leaving behind any sticky residue. The best part about this? Belif’s products are formulated without any mineral oils, synthetic fragrances, dyes, preservatives or animal origin ingredients, so their products are suitable even for those with sensitive skins. Here's an adorable video on their origins and roots! Belif prides itself in being a truthful and sincere cosmetic brand that marries traditional apothecary with modern Korean skincare science. With knowledge and processes passed down since 1860 from a British herbalist, Belif uses safe and innovative methods of extracting the goodness from natural herbs for their products, delivering exceptional skincare. WIN! 50 Lucky Altheans will stand a chance to win themselves a True Cream Water Bomb from Belif (75ml) worth USD36 each! All you have to do is fill in this form with the correct answer to enter. Super simple right? This day's contest ends at 11:59pm (KST) on the 19th of December 2017. And that wraps up Althea's 12 Days Of Christmas for 2017! We hope you had as much fun as we did during this giveaway, and hopefully, you guys won a thing or two! Thank you for your love and support, and we wouldn't be where we are without you. Stay tuned to our Instagram page @altheakorea for more love, giveaways, and fun! Have a holly, jolly festive season!